Obama “Direct Action” on Immigration – Republic or Monarchy? 2014 election victories for Republicans across the nation were clarion calls to reverse tyrannical actions by this sitting president. A rogue president makes for a very dangerous situation for us. 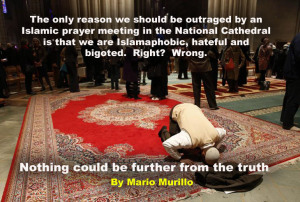 The only reason we can be outraged by an Islamic prayer meeting in the National Cathedral is that we are Islamaphobic, hateful and bigoted…right? Wrong. Nothing could be further from the truth. Here is the headline: The Washington National Cathedral hosted its first Muslim prayer service Friday in a powerful symbolic gesture aimed at uniting Christians and Muslims at the nation’s most prominent Episcopal Church.